Arriving in the mail yesterday was a parcel from Judyth in the swap on her group. This is the mother of all baggies! 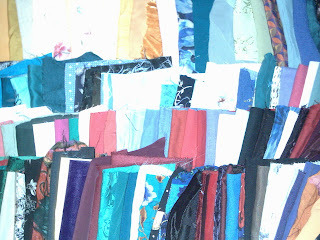 I will certainly never be stuck looking for a certain colour of silk ever again! I wish this picture was good enough that you could see all the brilliant hues represented but I hope it will at least show the scope of the various colours! 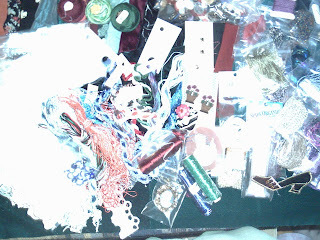 Besides the fabrics - enough for a king size crazy quilt if I were to put them all together - there is a glorious selection of ribbon floss, Edmar, hand-dyed threads, buttons, lace trim and motifs and so much more. Well, here is another transformation in the making. 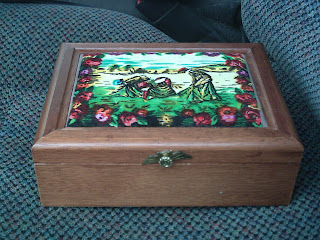 Although, at this point I have to admit nothing has been done except finding this jewelry box at the thrift store and parting with a dollar of my hard earned cash in order to bring it home! The wood is all in good condition, the knob is loose and the top has an inserted velour picture. The inside of the top is an ugly gold velour paper with a mirror glued on well enough to survive the end of the earth. The box has a ring tray inside of matching gold velvet and a lining of the same gold velour paper. What it does have though, as far as my initial inspecion shows, is a deconstructability that will enable me to make something else of it - something more pleasing to my eye even if the world at large may not agree! So, stay tuned - I will update this piece as I go along. I just finished this project last night in time to head away for Christmas. My niece, Terry, was considerate enough to have her baby on Boxing Day last year so I had 364 days to finish this off and still it be a Christmas gift this year! I found the picture originally in - of course - my local thrift store and admired the stitching as well as the lovely framing - especially the cute mat with it's balloon cutouts. So, after an investment of a dollar or two I bought it home and took it apart. 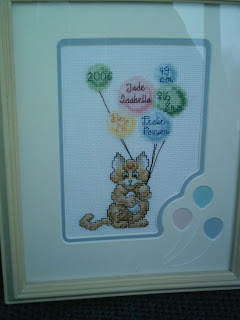 I graphed out the information on little Jade's name, date of birth, weight and length, and backstitched them onto the balloons. As soon as I saw this picture I knew this was what I wanted to do! Now, after cleaning the piece and reframing it, it is ready to give and I am quite happy with the way it turned out. 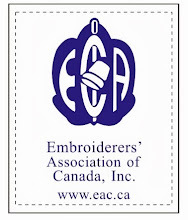 I have been enjoying the pictures and talk at CQI about what several of the members are doing with men's ties. I knew I had seen a picture somewhere in an old issue of Country Woman magazine of another example. Finally found it and wanted to provide a little additional inspiration! 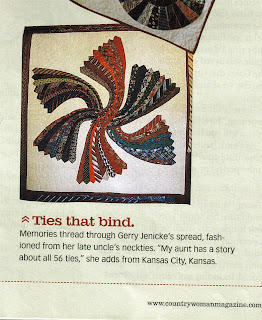 It makes you look at these ties a whole new way! 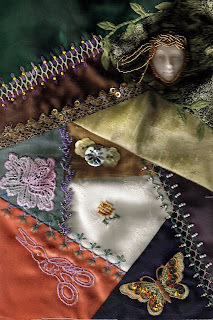 My compliments to Gerry Jenicke, the artist on this one for creating a meaningful memory as well as giving this piece a real "art quilt" look! I am going to try this one. I hope that it will help me in a couple areas where I am lacking - both colour and design. Keeping my fingers crossed that practice will make perfect! My apologies for the terrible picture - it is a scan and the cabachon face creates bad shadows. This is what I am currently working on. It seems to be slow going but I hope to finish it soon. I have three more seam treatments to go as well as adding some sort of flower to the ribbon stem and leaf seam. Then a couple more motifs and it should be ready to use. In spite of it being slow going, I am happy with the way each element has worked up, especially the lower two seam treatments. I am using tiger tape with these and it really seems to help with the consistency of the stitch sizing. The cabachon face I made with Fimo - it doesn't seem to want to stay put so more work needed there. The little button cluster has two dyed mother of pearl flower shaped buttons as well as a very pretty irridescent glass button in the center that doesn't want to show itself off in the scan. I think I will still add some beads to this for a bit more sparkle. 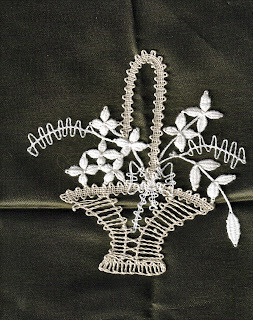 The stem stitch stork scissor motif if done with one strand of DMC and a bead for the sye. I have used this motif before, it is one of my favourites. This is the second piece of lace I bought the other day at the thrift store. I have removed her from her frame and will use her in stitching as well. She is a bit larger than the basket of flowers - about 6 inches tall (15 cm) and 2-1/2 inches wide (6 cm). She also appears to be handmade and worked on linen. It is very fine work and the flowers in the center are similar to those in the first piece. She has a linen band for her main structure which is bit different. So, I am wondering - is she the same type of lace as the basket of flowers and, if so, I am still wondering what type of lace this is?? I love her Madonna like qualities and will have to find a special project to use her on. Anyone who knows me, knows that I love to haunt the thrift stores and second hand stores looking for treasures to use in my crazy quilting. Sometimes I think it is half the fun! Last week I bought a framed bit of lace. After liberating it from the frame this is what I have. The question, though, is what is it? Does anyone know what technique this is? From the top of the handle to the bottom of the basket is about 3-1/4 inches (9 cm) and at its widest part it is about 2-1/2 inches (7 cm). 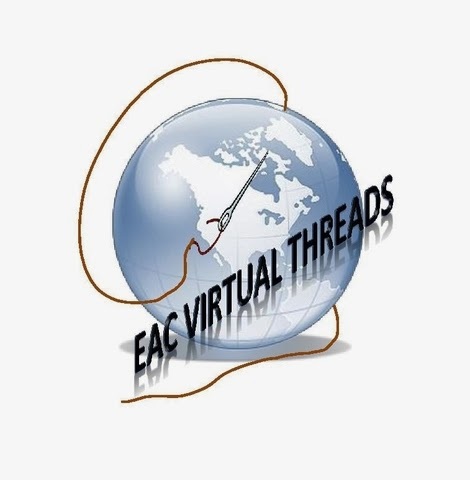 The thread is consistent with the thickness of regular sewing thread.